LONDON – Britain's auto industry, which lost its last major homegrown manufacturer in 2005, is back among Europe's top producers following an Asia-inspired revival led by Japan's Nissan Motor Co. and Tata Motors Ltd. of India. The UK built 1.34 million cars in 2011, a 6 percent gain, ranking it fourth in Europe and narrowing the gap with France and Spain. Estimated output of 1.45 million autos this year would be more than double the total in Italy, home to Fiat. Japanese carmakers, which chose Britain as a European base in the 1980s, account for 52 percent of the total after Nissan hit record production at the country's biggest plant in Sunderland, north-east England. Luxury UK nameplates, which survived through foreign takeovers, are also helping an economy on the brink of recession, with Jaguar Land Rover, bought by Tata from Ford Motor Co., recruiting enough people to contemplate three shifts at its Solihull plant for the first time in 60 years. "It's astonishing," said Tony Walker, the deputy managing director of Toyota Motor Corp.'s British unit, where he began in 1990 after working at Ford. "I could never have imagined that Japanese companies could have been making the majority of cars in the UK"
Overseas carmakers are filling a void left by a decline in Britain's auto industry that followed the nation's entry into the European Economic Community in 1973. The decision prompted a surge in imports – which rose from 8 percent of sales in 1968 to 50 percent by 1979 – exposing the poor quality of UK models, said Garel Rhys of Cardiff University Business School, who blames bad management for an "entrepreneurial gap." The decline in domestic manufacturing culminated in the 2005 collapse of Birmingham-based MG Rover, the last volume producer and a relic of postwar consolidation that took in dozens of brands including Austin, Morris, Triumph and Wolseley. UK output peaked at 1.9 million vehicles in 1972, 50 percent of them built by British Leyland, later part of Rover, according to the Society of Motor Manufacturers and Traders. The industry group said that total could be surpassed within five years, given commitments for the UK manufacture of models such as Nissan's Leaf electric car and a roadster version of BMW's Mini, made in Oxford, near London. UK output this year will be within 200,000 units of Spanish vehicle production and 300,000 of French production, according to PwC's Autofacts automotive forecasting division. Germany is Europe's No. 1 producer, making 5.5 million cars in 2010, more than twice the number in France. Italian output fell 15 percent to 456,000 cars in the first 11 months of 2011, automaker association Anfia said. Nissan's vice president for the UK, Kevin Fitzpatrick, said in an interview that Britain's auto industry is undergoing a "renaissance." 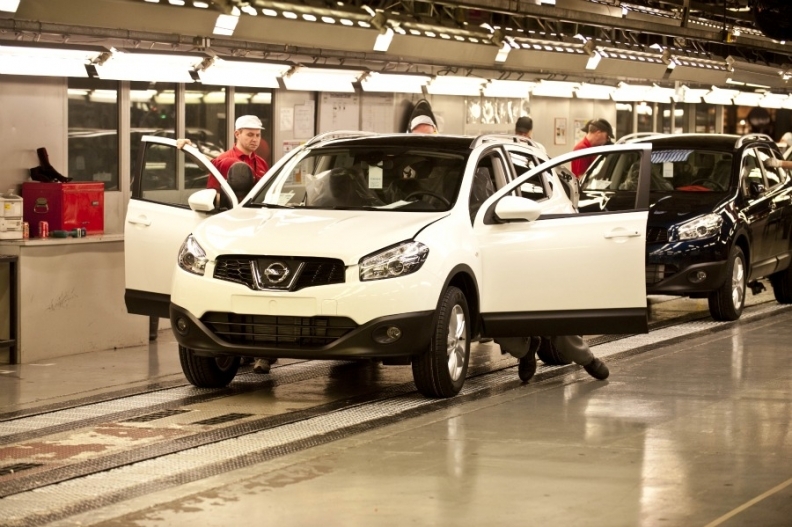 The Tokyo-based company, which established its Sunderland plant in 1986, now accounts for one in every three cars built in the UK, led by its Qashqai crossover. "All companies have invested quite heavily; we certainly have," said Fitzpatrick. "So what we've got now is quite a modern industry with good facilities." BMW plans to spend 500 million pounds (600 million euros, 780 million dollars) in the UK by 2014, taking investment to more than 1.5 billion pounds since 2000, when a failed rescue of Rover caused it to sell the main business for 10 pounds. Mini sold a record 285,000 cars in 2011, while luxury unit Rolls-Royce, marketed as a British brand despite being BMW-owned since 1998, sold 3,538, the most in its 107-year history, aided by a new factory. Jaguar Land Rover will spend 355 million pounds (426 million euros, 553 million dollars) on a new engine plant, it said Sept. 19. It's also adding 1,000 workers in Solihull, where the Range Rover and Discovery luxury SUVs are made, or enough to add a shift, the BBC reported Jan. 20, citing unions. JLR said it doesn't comment on work patterns. The automotive industry employs more than 700,000 people from manufacturing to retailing, according to the Society of Motor Manufacturers and Traders. Toyota, which builds the Avensis and Auris models in Burnaston, England, and engines in Wales, set up in the U.K. in part because of the size of the market, Walker said. While Japanese companies were drawn by sales opportunities as homegrown output fell, Britain has become important for satisfying regional demand, helping to make autos the UK's third-biggest export after engineered goods and oil. Three-quarters of cars sent abroad go to European Union countries. Carmaking has emerged as a success story even as UK unemployment rises and consumer confidence falls. The economy probably shrank in the fourth quarter for the first time in a year, according to a Bloomberg News survey of 33 economists. The contraction may herald a slide back into a recession, the Ernst & Young ITEM Club research group predicts. The biggest threat to UK production levels may be from fluctuations in the value of the euro versus the pound, said Peter Schmidt, managing director of Automotive Industry Data, based in Warwick, England. Sterling fell 38 percent against the euro between 2000 and 2010, making British products less expensive for Europeans, just as the proportion of UK-built cars that went for export rose from 65 percent to 76 percent, according to SMMT figures. Toyota is effectively hedged because it buys parts from UK suppliers in euros, according to Walker. Graham Hoare, executive director of powertrain engineering at Ford, which last year built 1.7 million engines in Dagenham, London, and Bridgend, Wales, said that the opposite applies, with many components sourced from continental Europe, so that a weaker pound creates "headwinds" and makes it tougher to remain competitive. "If the euro were to founder it could lead to the closure of one UK plant after another," said Schmidt. "Manufacturers cannot afford to make cars at a loss. Nobody can."